Dzl 770LMT GPS preloaded with street maps for Australia and New Zealand. Lifetime Traffic Receiver/Vehicle Power Cable (12/24 Volt). Unit Dimensions (W x H x D). 19.81 x 12.11 x 2.55 cm (7.80" x 4.77" x 1.0). Display Size (W x H). 15.3 x 8.5 cm (6.0" x 3.4"); 17.6cm diag (7). Display Resolution (W x H). Multi-touch, capacitive; WVGA colour TFT with white backlight. Rechargeable Lithium-ion (Up to 1 hour battery life). 3-D Buildings & Landmarks View. "Turn right ON ELM STREET in 500m". Voice-activated Navigation (operate device with spoken commands). Traffic compatible (routes around traffic with a receiver and subscription). Yes (receiver and lifetime traffic included). Lifetime Traffic Updates (receive free lifetime traffic updates). Lane Assist (guides to proper lane for navigation). Junction View (displays junction signs). Route Avoidance avoid highways, tolls etc. Speed Limit Indicator (displays speed limit for most major roads). Exit Services (tells you approaching services on highway). Custom POIs (ability to add additional points of interest). External video input for reversing cameras. Custom truck routing for the size and weight of your truck. The dezl 770LMT has detailed maps for Australia that also include truck-related restrictions like bridge heights, sharp curves, weight limits and more and related information for most major roads and highways. Just enter your vehicle profile information (customisable by height, weight, length, width and hazardous materials) and find truck-preferred routes suitable for the size and weight of your truck. Simple Truck Profile lets you easily swap trailer sizes with the touch of a button. The onboard Trip Planner lets you create multiple-stop routes and plan and save future trips. Easy Route Shaping lets you easily change your route to include preferred roads or cities, just by touching the screen. Dezl 770LMT keeps you informed of upcoming road conditions and restrictions, including sharp curves, bridge heights, weight limits, high wind areas, no trailer or hazardous materials. Alerts for steep grades prepare you to shift accordingly. Trucking speed limits appear if they differ from the posted automotive speed limit. It's also compatible with the BC-20 Reversing Camera, and can easily toggle between camera and navigation modes. 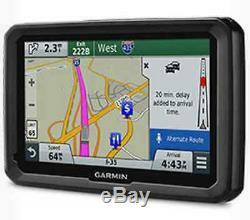 Garmin dezl 770LMT Truck GPS. See more of the road around you. The dezl 770LMT has a brilliant 7.0-inch glass display, that is easy to see across your cab. Extra-loud, enhanced speakers deliver clearly spoken, turn-by-turn directions that are easy-to-hear even over road noise. Spoken Garmin Real Directions guide like a friend, using recognisable landmarks, buildings and traffic lights, rather than hard-to-see or hidden street signs. You can also sync a Bluetooth-enabled device, such as your smartphone, to the dezl for hands-free calling through its integrated microphone and speaker. The 770LMT has a Service History Log so you can record the dates and type of service performed. Conveniently keep track of tire mileage, tire pressure, oil changes, tire changes and more. Active Lane Guidance with photoReal Junction View. Know the lane before it's too late. Dezl 770LMT has Active Lane Guidance (ALG). ALG uses voice prompts and brightly coloured arrows to indicate the proper lane needed for your route. PhotoReal junction view shows exits as they appear in real-life: in full colour and great detail. Bird's Eye junction view offers a detailed view of interchanges, looking down from overhead. Garmin Free Lifetime Map Updates. The Garmin dezl 770LMT comes with lifetime map updates for free. A combination power cable/traffic receiver in the box gives you traffic services for the life of your device. You'll avoid traffic jams and keep moving when your 760LMT alerts you and offers detours. Creates a seamless navigation experience with your Android smartphone. 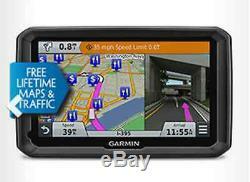 This GPS is compatible with Garmin Smartphone Link Android App. It also gives you local weather using your smartphone's mobile data plan. There are also optional subscription services available - fuel prices and safety cameras, which you can pay for and activate from within the app. You can also access live weather information, and Star POI Ratings, allowing you to rate Points Of Interest. The extra subscription services include Safety Cameras, a service which alerts you to fixed and mobile safety cameras to help you arrive safely at your destination. You can also download Fuel Prices, which locates the best price for any type of fuel in your area. The item "Garmin Dezl 770LMT Truck GPS Navigation lifetime map updates active lane guidanc" is in sale since Monday, October 19, 2015. This item is in the category "Vehicle Parts & Accessories\Vehicle Electronics & GPS\GPS/Navigation". The seller is "bikerboy111111" and is located in Burwood, VICTORIA. This item can be shipped worldwide.